Paris Design Week must feel like a natural extension of daily life for those who call the city home. With no distinct lines between design, art, architecture, food and innovation, the French capital has a tendency to cultivate connoisseurs. The festival itself began three years ago, spawning from Maison & Objet, the biannual interiors fair that attracts a healthy 85,000 trade visitors. With a design savvy audience pouring back into the city on a daily basis, it was inevitable that the fair do the same, extending the trade show aisles through to the city’s boulevards and revealing the talents within. As the festival spans out across the city through galleries, showrooms, markets and hotels, these design events blend seamlessly into the larger cultural calendar and set the tone for the festival itself. The Palais de Tokyo – the largest non-collecting contemporary art museum in Europe – occupies a hillside on the Seine between the Champs-Élysées and the Eiffel Tower, reconciling the old and the new. 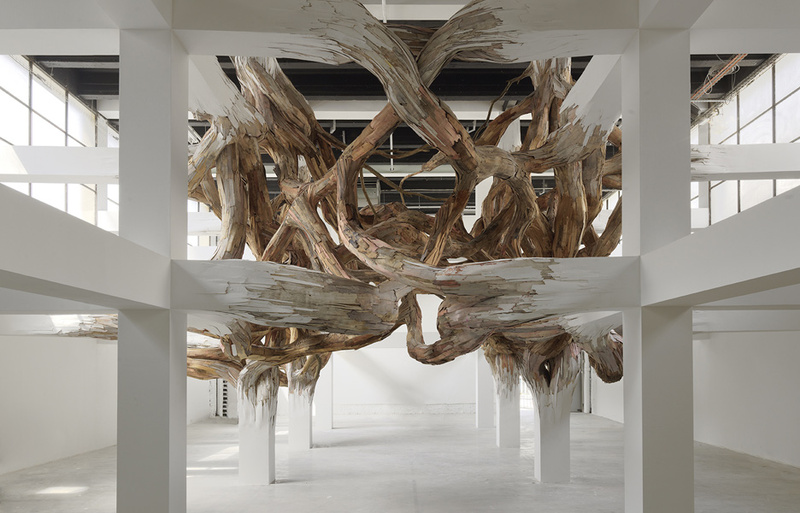 As part of the museum’s latest exhibition, Nouvelle Vagues (New Waves), French curator Marc Bembekoff invited Brazilian artist Henrique Oliveira to transform one of the building’s grand alcoves with the site-specific installation, Baitogogo. 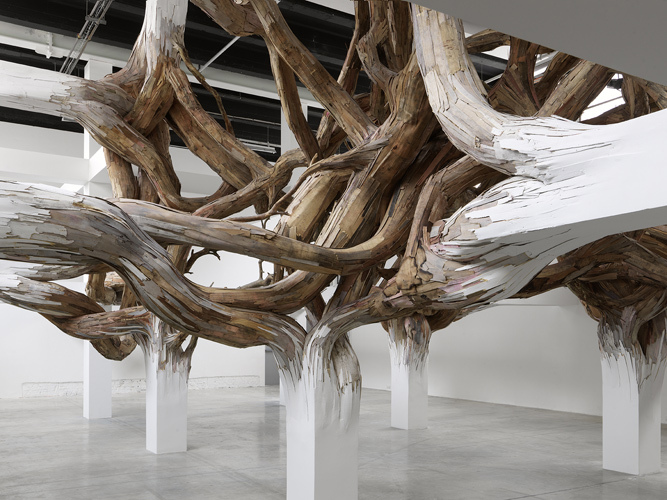 Within the installation, the building appears to grow and mutate inwardly, giving rise to an invasive Gordian knot of twisting limbs. A hybrid of the structural and vegetal, it is described by the curator as an “architectural form of anthropomorphism,” as Oliveira extends the existing structural elements of the building to form a matrix within which the organic organism comes to life. Individually coloured slivers of wood are nailed into a composition that is both familiar and unexpected. As visitors walk through the space, they are witness to the artist’s fascination with paradox as the experience of peaceful awe is quietly shadowed by a sense of danger. As with much of his work, Oliveira utilises urban materials common to São Paulo, in particular the wood ‘tapumes’ (fencing) used across the sprawling city to fence off building sites. In its original context the material is identified with the growth of urban construction; Oliveira brings this idea of an endemic organism to life, leaving the viewer to contemplate the nature of growth. Having experienced this immersive installation, the entire festival then seemed to reveal an underlying fascination with the natural world. Across the river at The Docks, another South American designer, Juan Fernando Hidalgo, was showcasing his own interpretation of local materials at Now! Le Off, an avant-garde extension of Masion & Objet. Since 2005, Hidalgo has been researching the use of totora, a bull rush-style reed native to South America, as a construction material. The Andean people have traditionally used totora for creating mats, rafts, houses and even floating islands. Graduating with a masters in sustainable architecture (Bologna, Italy) in 2012, Hidalgo’s work has extended from architecture into creating malleable textile structures for furniture, flooring, wall treatments and accessories. In his Totora bench and flexible lounger, a soft surface is made out of thousands of reed stems that then flex and move against one another, responding naturally to pressure and body shape. For many designers, nature is the most inexhaustible source of inspiration. Still, with the infinite iterations of floral prints and natural forms that saturate the consumer market, credit must go to those who respond with sensitivity and originality. Over at the Carpenters Workshop Gallery, nestled in the narrow streets of the Marais, London-based Australian designer Charles Trevelyan takes a more scientific approach in his first solo exhibition, Between The Lines. 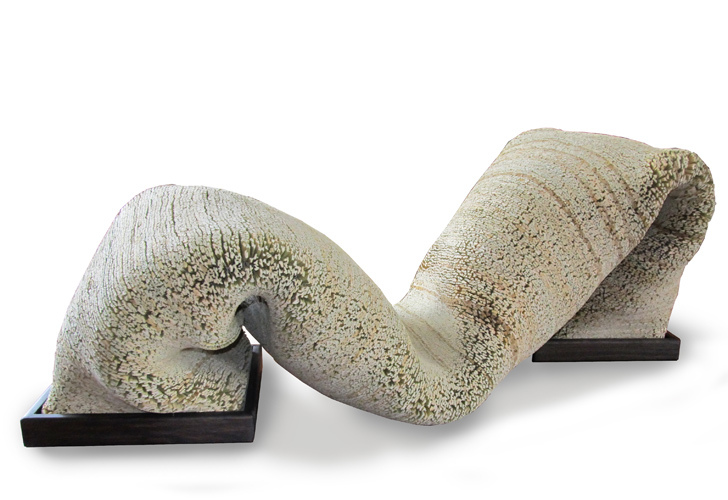 Here, the organic forms of these limited edition pieces appear to have grown out of an exploration of materials and are more an extension of the design process than a predictable homage to the natural environment. The collection has been created based on a scientific calculation of structure that is resolved sculpturally, however functional the pieces may be. 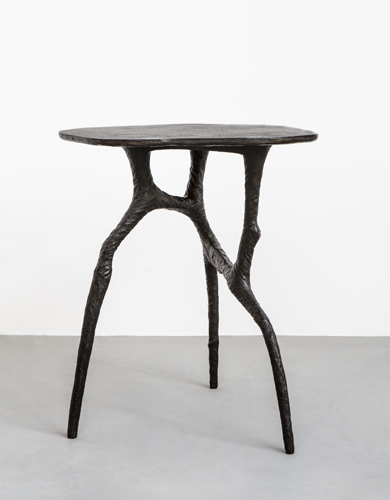 Trevelyan uses bronze moulding techniques to create the patina and variations in colour but it’s the complex aesthetic – familiar yet unusual – of the organic limbs that gives the pieces their slightly hypnotic quality. Not to be outdone, the halls of Maison & Objet are bursting with natural life from Marimekko’s Weather Diary collection to the Vegetal Atmosphere structures by French designer Alexis Tricoire. However it is the lighting installations and fixtures in ‘Iluminations’, part of the show’s ‘Inspirations’ pavilion, that attracts visitors like moths to a flame. Etienne Rey is a French artiste plasticien who juggles the components of light to create immaterial installations in which the experience is key. Rey’s designs approach light and colour from the phenomenological, his work manipulating our perception as a spectacular sunset does, made up of a series of evolving, inter-related sensations. The immersive installation, curated by Elizabeth Leriche, is a new piece by Rey titled Space Odyssey. 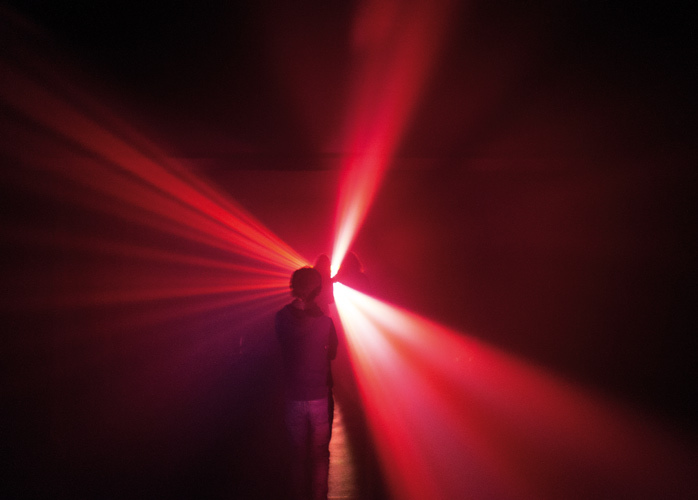 Viewers are drawn through the dark space along a single marked pathway, each silhouetted by the light as the next waits to experience the display. Reminiscent of the star gate scene in 2001: A Space Odyssey, the installation serves as a reminder that our natural universe extends far beyond the familiar forms of the flora and fauna of Earth. The festival trail culminated in a tour of the Grand Palais for the new biennial exhibition of fine craft and creation, Revelations. In this first edition, the artistic steering committee drew attention to the craft professionals of Norway, including the collaborative work of studios StokkeAustad and Andreas Engesvik. The Woods is the second collaboration between the studios, inspired by the Northern Lights and the seasonal changes in colour and transparency of the trees of the Scandinavian woodlands. 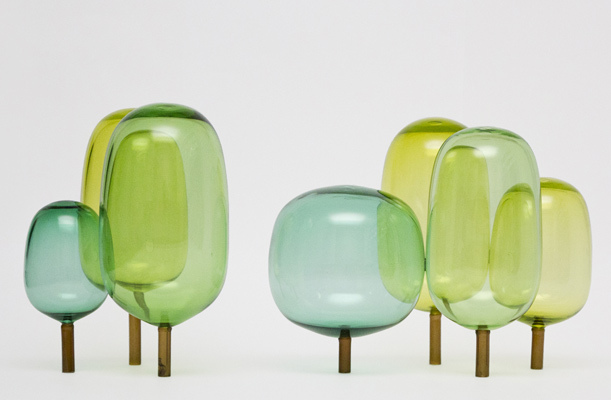 Each of these unique, hand-blown glass sculptures consists of seven trees joined in sections to allow them to stand freely. Purely decorative, these contemporary ornaments are a testimony to the beauty of nature and respect for fine craftsmanship. After days spent combing Paris for examples of leading design and inspiration, it is these works, which strike a balance between familiarity and complete uniqueness that refresh the eyes. Seemingly simple but inherently complex, each piece is beautifully designed, just as nature intended.